Indie Hurricane: a whirlwind of community | Story by the Throat! I played some great Dreaming Crucible games, including an impromptu demo with a teenage girl that turned into a full-blown game, in which she brought a lot of her personal thoughts and experience to the story. I played an uproarous game of Zombie Cinema, in which the attendees of a Vegas bachelor party utterly failed to cope with the living dead crashing their festivities. I played a PSI*RUN game with a pitch-perfect resolution to our troubled, super-powered youngsters’ ordeal. I played a session of Hot Guys Making Out that was dripping in sensual passion, in which the tormented nobleman Honore and his earnest ward Gonsalvo consummated their forbidden love despite the maid Maria’s petty interference. I played the Shelter in Place zombie LARP, in which I found a nice emergent dynamic of people under pressure behaving badly. I played an engaging game of Apocalypse World, in which my Maestro D’, Proper, took some crazy Quarantine’s ear for shooting a kid. On top of that I worked the Indie Hurricane dealer table (alongside a dedicated crew of volunteers) and sat on two panels, Fluency Play with Willem Larsen, and Religion, Faith and Roleplaying with Ben Lehman and Hans Chung-Otterson. They both were thoughtful and enjoyable discussions with engaged participants. And that little snapshot is only a tiny slice of the entire Indie Hurricane experience! Many, many people were rocking their favorite games with longtime friends, or else encountering something new and loving it. I learned a lot from organizing this con. 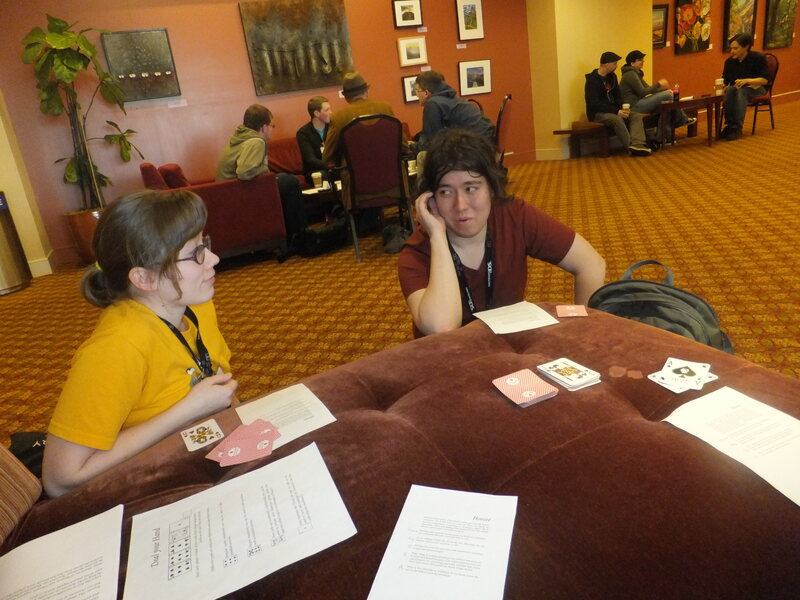 For starters, I learned a thing or two about navigating an institutional environment, in other words communicating and collaborating with the Gamestorm committee, and advocating for the needs of Indie Hurricane’s designers, facilitators and players. I also learned the power of delegation; I asked Hans Chung-Otterson to be my assistant, and he proved invaluable in handling logistical and physical details that would’ve driven me crazy to handle alone. And I became more comfortable with asking other Hurricane volunteers and participants to take charge of various tasks and projects. And I learned how to format the kind of game facilitation that the Northwest story gaming community prefers in a way that makes sense for Gamestorm’s scheduling methodology, in the form of Open Gaming Circles that function as scheduled events with set GMs while allowing the spontaneity and egalitarianism of pickup games run by anyone who’s willing. All of this means that organizing in the future will be so much easier and enjoyable than ever before. But what I learned most of all is the value of community. This was more than a convention for me; this was a gathering of friends sharing their hearts, sharing their dreams, sharing story, in the most powerful form I know. And the organizational lessons I learned aren’t about “leadership skills” or administration or anything like that; I see them as tools for building solidarity. I have high hopes that Indie Hurricane will continue building and refining a space where everyone is a designer, a creator, an artist, and where everyone feels safe and supported in exploring difficult and genuine emotional content through games.